I think of the average person as a frugal use of potential, given the actual capabilities of humans. I started taking classes at my local parkour gym a few months ago, after some casual exploration during their open gym times. 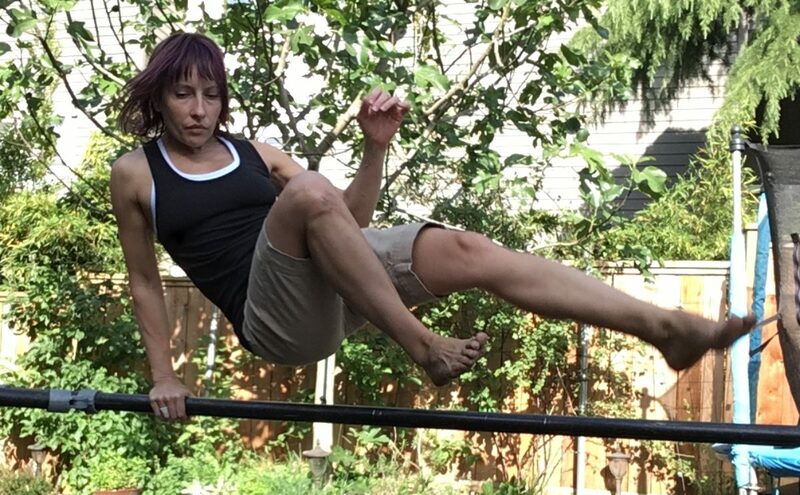 A parkour gym is like permission to do what I would do all the time, everywhere, if I were not afraid of being laughed at for using my body in typically forgotten and neglected ways…or bailing hard. Admittedly, in my first class I got literally WIPED across the floor. Imagine a petite unconditioned Mom on the far end of a resistance band from a 6-foot+ slab of man, while he is sprinting. Thankfully I was able to laugh it off. I have made a little progress since, though I think we can all agree I am not a superstar. The thing is, that I love doing it so much that I won’t let the fears, embarrassments, and bruises deter me. Some people see parkour as a competitive, show-boating, adrenaline-fuelled dude-fest, but I think it is for everyone. The good practitioners seem to do the impossible, but only because the majority of us have come to ask so little of our bodies. This video shows me working on slide vaults; notice how I am gaining confidence with successive passes. First I use my foot (a step vault), then I skim over the vault, and final get a little air. It took me 1 month of conditioning classes (once a week), then another month of technical classes (once a week), to do a slide vault as seen on the last pass. I am trying not to expect too much too soon, but I do want to see how good I can get.